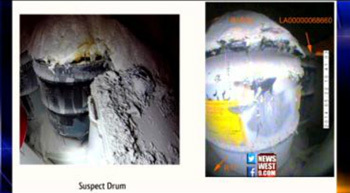 ANDREWS – NewsWest 9 has new details on five potentially explosive containers of nuclear waste. Turns out, they are all being stored in Andrews County. That waste came from the Los Alamos National Laboratory. They could be tied to a drum that caused a radiation leak at the underground nuclear storage site in Carlsbad. NewsWest 9 talked to Waste Control Specialists in Andrews County about the dangerous situation and how they’re handling it. The New Mexico Environment Department confirms the Department of Energy is taking a closer look at six waste containers, all of which have very high acid levels along with nitrate salts mixed with organic kitty litter. Those six include the one which leaked radiation at the Waste Isolation Pilot Plant in Carlsbad. The other five are stored temporarily at Waste Control Specialists in Andrews. Copyright © 2009-2018 Nuke Free Texas. All Rights Reserved.